Professional Handyman Services | Odd Job Handyman Services, Inc.
Power Wash Your Deck the Better Way! POWER WASH YOUR SPRING SPACE! Your deck or porch can look this beautiful too! Spring has arrived — before you entertain guests, or enjoy those relaxing moments outside, why not freshen up your deck or porch with a power wash system from Odd Job? Our handymen will arrive onsite with our specialized equipment, using our process to have your space looking as good as new without damaging the wood from over-pressure, as some companies do. Don’t wait–give your porch or deck that brand new look with a spring cleaning from the pros at Odd Job! Book us today! Remember…keep calm. Spring is here! Top Ten Tools: The Basic Must-Haves for Handymen and Homeowners Alike! Ten indispensable tools that our professional handymen are using and that you should have! Getting a basic toolkit together is easy! Justin, the expert behind Odd Job Handyman Services, lays out the top ten tools that everyone, handyman or homeowner, should have. and explains why every home-owner should have one of their own. While not a multifunctional tool, it is the only thing that will do the trick when you need to get into the drain under the sink. Go ahead, be the hero who can rescue a dropped earring from the j-trap! Also known as a box-cutter, this will always have an undisputed place among the top ten tools. Be sure to get a knife with a retractable blade, one that is replaceable. That way, you can always use a clean, sharp edge. Utility knives are inexpensive, but they’ll cut through most materials, from moving boxes, to carpet, to thin wood veneer. Every tool kit should have adjustable wrenches in two sizes: a 6” and a 14”. Because not every bolt comes loose with the twist of an Alan-Key. 7. Strong Pliers with Built-in Wire Cutters. Pliers allow you to get a grip where your fingers might not – tight spaces, sharp or heated surfaces. Not to mention that you can bend, strip and cut materials safely and easily with a good set of pliers. 6. A Drill/Driver Combination Tool. Essential to anchoring frames on the wall, everyone should make this their first power tool purchase. Get a combination drill and driver tool that can drill holes in the wall with a drill bit, then seamlessly get to work fastening with flat- and phillips-head attachments. Pick up a tape that’s at least 25 feet long one inch wide. This will be big enough to measure most things and strong enough not to bend for up to 8 ft.
Sure, you can pick up a cheap plastic level at the Dollar Store, but a savvy homeowner will invest the money in a laser level. You’ll get hands-free, precision accuracy every time, and you don’t have to keep sliding and readjusting as you work along larger surfaces. These little guys come with different tips to accommodate different screws. Ensure that the set you choose has various sized Phillips (cross-shaped), Robertson (square-shaped) and flat heads. The 16oz Rip Claw Hammer would be my tool of choice. It’s a sturdy hammer that is easy to control. 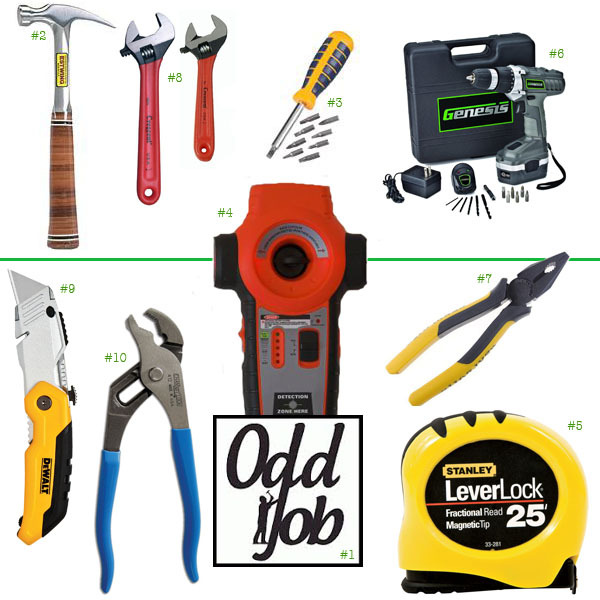 That’s right – we’ve listed the top ten tools, and number one is, hands down, the Odd Job Team. Property owners, real estate brokers and thousands of homeowners will attest to this, alongside brands like Shoppers Drug Mart, Burberry, Holt Renfrew and LensCrafters. Sure, it’s great to handle the small stuff on your own, but every homeowner will be faced with projects they shouldn’t tackle alone. That’s where we come in! If your task has taken you beyond these basic tools, give my team of experts a call at 416-520-1161 or use our online “book-a-handyman” form. 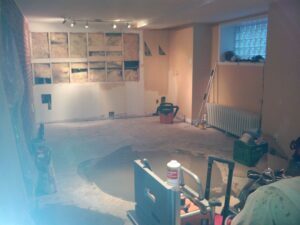 Professional Tiling – Witness the Magic! 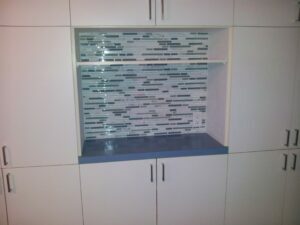 Take a look at some of our professional tiling team’s recent conquests! 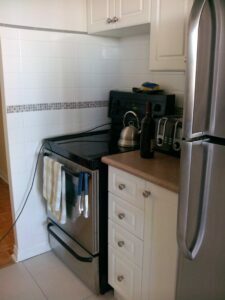 We installed a tiled backsplash around the oven, tying it in with the original work. Installing mosaic tiles can bring the right vibe to your kitchen! This tiled porcelain floor was a perfect fit for this powder room! 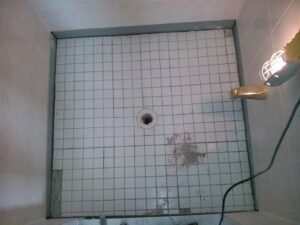 Look at what Odd Job was able to do for this shower floor! We replaced all the rotten tiles and re-grouted the base! One of the many things that makes Odd Job different is that we have specialized teams of handymen for each type of project. When you book with us, our office staff will ‘match’ you with licensed, insured, bonded and identity-and-background-checked professionals. Our professional tiling contractors will be happy to repair, replace and install your tiled floors – ceramic, porcelain, glass and more. As you can see, replacing the tiles isn’t always necessary. 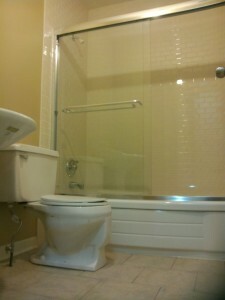 In many cases, we’ll simply need to replace the adhesive or selectively target wet or dry areas or replace the grout. Our professional tiling contractors aren’t like many others in that they’ll be as happy to complete small-scale repairs as they will be to take on larger installations. 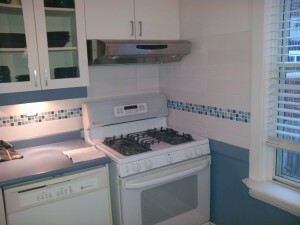 Why do we receive hundreds of service requests for tiled backsplashes every year? Why have tiles been a staple of interior design since the beginning of human civilization? 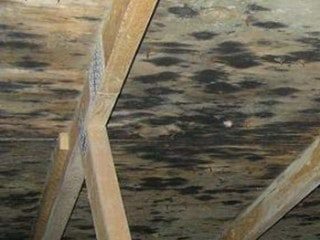 Because they’re easy to maintain, they’re gorgeous, and they allow the homeowner to capture a vibration that is simply indescribable. 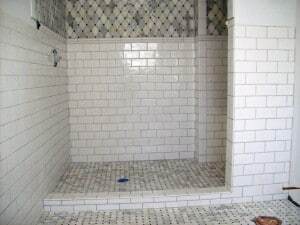 Our team has decades of experience installing tiles for residential and commercial clients all over the city. Book or call today, and our professional tiling contractors will ensure that you witness the magic in your home. 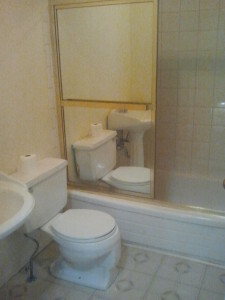 This project took six days, and because we didn’t change the position of the bathroom fixtures we didn’t need a permit. Great! 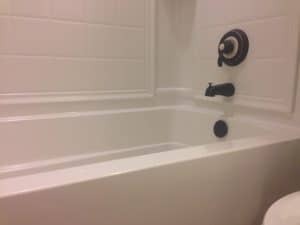 This aging bathroom needed a refresh. 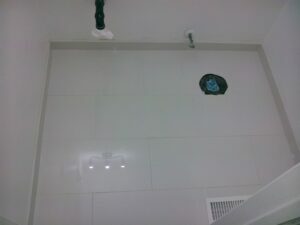 We added a water-proof membrane to the walls..
..and installed perfectly symmetrical, even-leveled tiles. Looks great, huh? 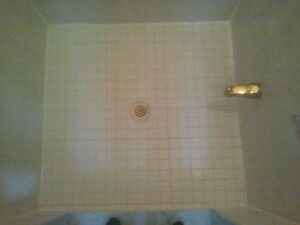 New tiled tub surround, new shower door, new paint. I love this new bathroom, from the clear glass tub doors, to the small brick pattern on the tile surround that is carried onto the floor. Using this patterns makes the room seem larger while tying every thing together cohesive. 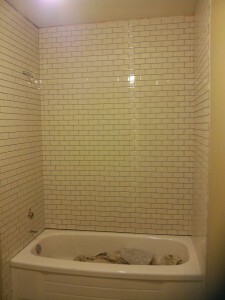 The walls are painted a dark taupe that is carried into the grout on the floor. Is it time for Baby Proofing at your home? Is your little one fast asleep? Great, let’s play the baby proofing game. Get down on the ground, sit or lie down if you can. Now look at the room you’re in from this new perspective. Are there lots of interesting things on the ground? If you needed to pull yourself up right now, what’s handy? What’s small enough to put in your mouth? What’s big enough to get your hand into? What else do you see from your baby’s vantage? Installing safety latches on kitchen and bathroom cabinets and drawers to keep children from exploring. This will prevent them from finding potentially poisonous household products, kitchen and bathroom appliances, knives, etc. Consider adding drawer locks in a home office as well. Securing all bookcases, shelving, and heavy furniture to walls with brackets and anchors to prevent it from tipping over. Toddlers learning to stand and walk tend to pull themselves up by whatever they can grab, so make sure that what they reach for won’t come tumbling down on them. When storing items, put heavier items on bottom shelves and in bottom drawers for stability. Installing locks to chest freezers and any extra refrigerators to prevent children from exploring and getting trapped. Installing door closers on doors that lead to basements, garages, pools and other hazard rooms. This will close the door behind you, even if you have your hands full. Installing or repairing a fence and gates to enclose your yard and keep your kids safely at home. Installing toilet locks to keep toilet lids closed. Children are more top-heavy than adults and can lean and fall into a toilet easily. They also can drown in just one inch of water. Upgrading electrical outlets near water sources to those with ground fault circuit interrupters (GFCIs), which turn off electricity if appliances fall into water. Installing safety gates at the top and bottom of stairs and in the doorways of rooms with hazards. While gates with expanding pressure bars are great for doorways, they should not be used for blocking stairs. Installing corner and edge bumpers on furniture and other items like a fireplace hearth to protect against injury. Replacing old windows or adding stops to the frame so that the window cannot be opened wide enough for a child to fall through. Replacing any old or broken blinds, shades, and draperies. Install blinds that lock when fully up or down and avoid looped pull cords as they can be a strangulation hazard. If it’s time to any of these or any other baby proofing upgrades to your home, call Odd Job at 416-520-1161, or book online. We look forward to working for you. 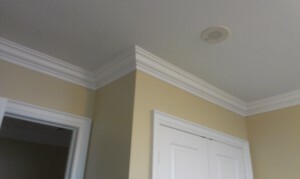 We can install new interior trim, moulding, crown moulding, baseboards in any room you desire, and with beautiful results. 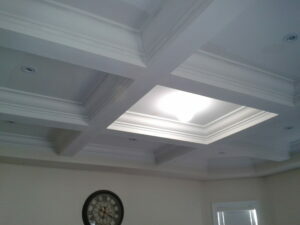 We can also build cornices, decorative columns, faux ceiling beams and beautiful coffered ceilings. Many installations take just a day! Our professional installers also adhere to a strict installation method that virtually guarantee’s great results that last and last. Unlike most budget installers we don’t skimp on the important parts of the job, we nail a cleat behind all moulding’s to ensure perfect results and glue all seams and joints to ensure that they don’t return for a visit in the future. 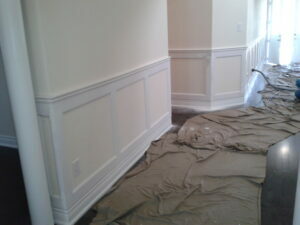 Finally we caulk all the seams and paint out the installed moulding with any paint the client desires. 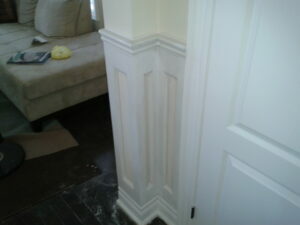 Be proud to show off your moulding for years and years, choose Odd Job to get you there. Call us about our rates. We’d be happy to talk to you. From start to finish Oddjob can help with even those bigger jobs on your mind. 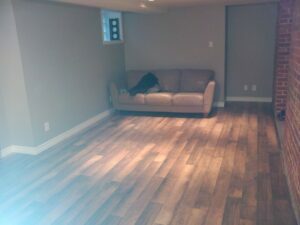 Finished basement room with new flooring baseboards, painting. 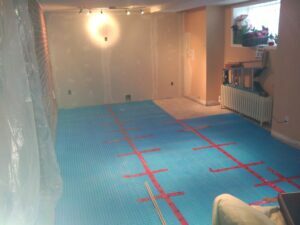 We leveled the floor, added a water proofing membrane, a new sub floor and then beautiful new flooring in this new great multi purpose room. New drywall, paint, lighting and baseboard and this room was complete! 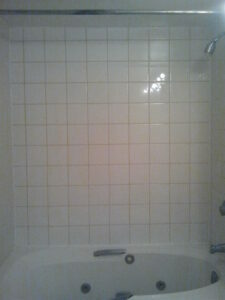 Damaged tiles in a tub or shower area can be a source of problems if left unattended for a while. We can repair and replace even just a few tiles, before they cause a bigger issue and if the tiles match you’ll never know anything happened. Retail spaces come with their own set of challenges, and a good Retail Property Manager such as yourself will want to have a trusted handyman to call whenever minor repairs or major changes pop up. 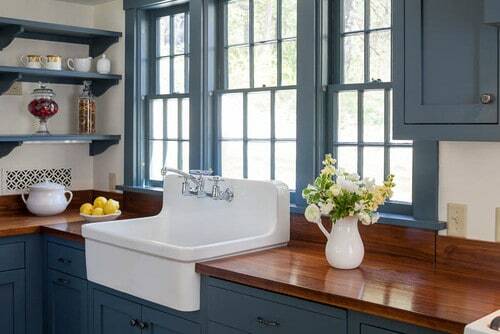 Breakdown or install shelves, display racks and cabinets, counters, etc. General repairs for shelves, display racks and cabinets, counters, etc. 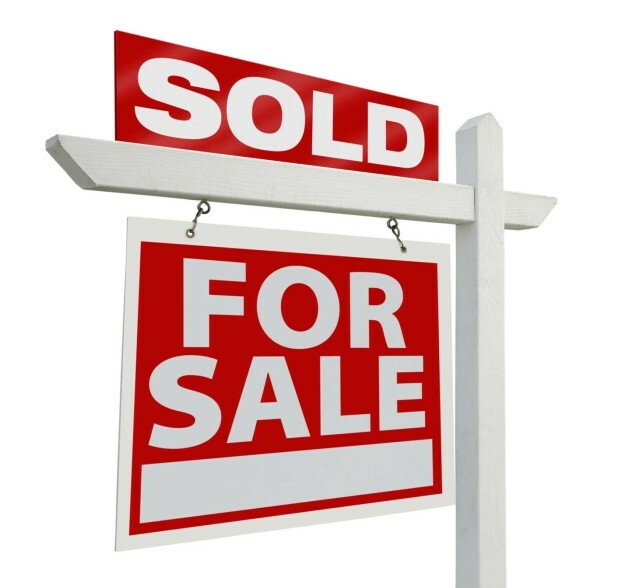 As a Real Estate agent, you know the value of having the right contacts in your professional network to help you turn a sale around quickly. Make Odd Job Handyman Services your secret weapon – we can help you and your clients repair and refinish properties to ensure they get their full value at market. Give us a call at 416-520-1161 or book our team online. As hands-on, creative people, we love Ikea Hackers – a blog dedicated to customizing and making the most of the “Build-it-Yourself” furniture. Ikea hackers use a shoe rack to hang a flat screen TV. 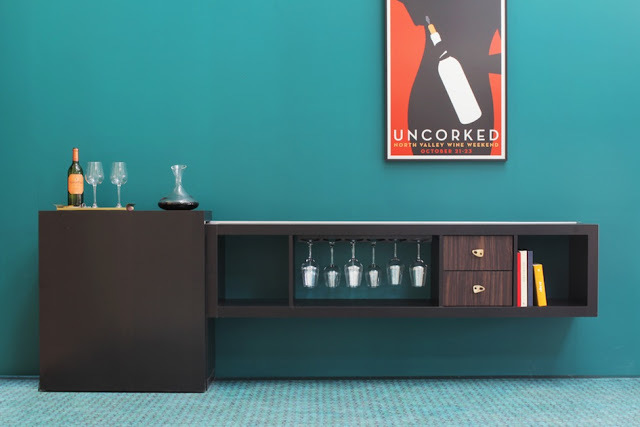 Ikea Hackers turn bookshelves into a fab bar. Have you been inspired by Ikea Hackers but don’t have the skills to pull off the “hack” yourself? 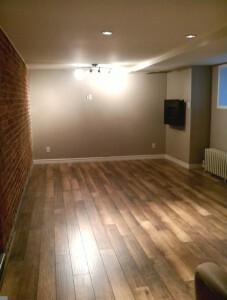 Give us a call at 416-520-1161 to discuss the project, or just use our super-simple online “book-a-handyman” form. One of our corporate clients wanted to create a more engaging atmosphere for their employees, and they knew exactly who to call. Our team had done work for these folks before, and they had learned through experience how important quality, efficiency, honesty and above all, creativity is to us. We added photo murals to two office walls, one featuring Star Wars, and the other, Star Trek. Pretty cool, eh? May the Force be with these clients and their cool new space. Boldly go where few offices have gone before… a photo mural! 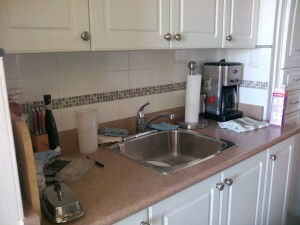 Our client had just moved in and wanted to do a few upgrades to her kitchen. We tiled the backsplash. What do you think? 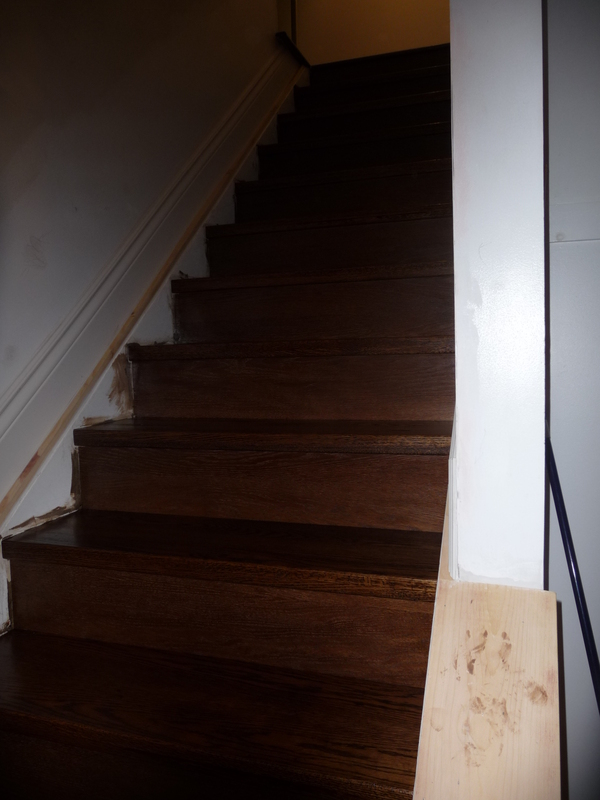 The basement stairwell of this house had seen better days, and it was time to patch up some holes, add a railing and give the steps a rich new finish. Our first job was to repair and paint the stairway. There was a lot of damage to smooth out in the stairwell to get ready for painting. With the wall fixed up, a railing was installed for added safety. You should always have a handrail in your stairwell, so we’ve installed one here. 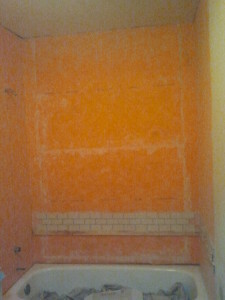 Finally, we taped up all the walls to protect our hard work, and gave the steps a rich new finish. Like the result? 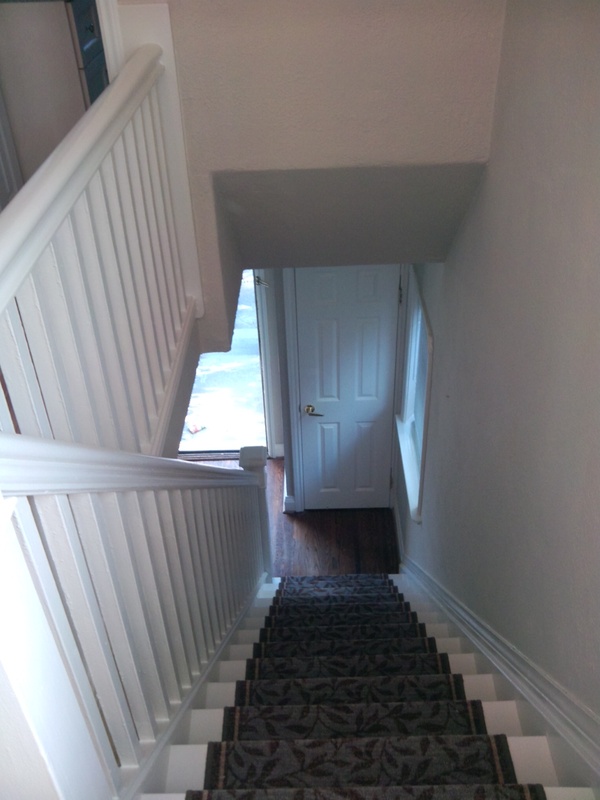 Check out what we were able to do for another homeowner’s stairwell with some paint and a carpet runner, and don’t forget to take a look at our service list for halls and stairways if you’d like to know what we’ll do for your stairwell! First impressions are everything, right? 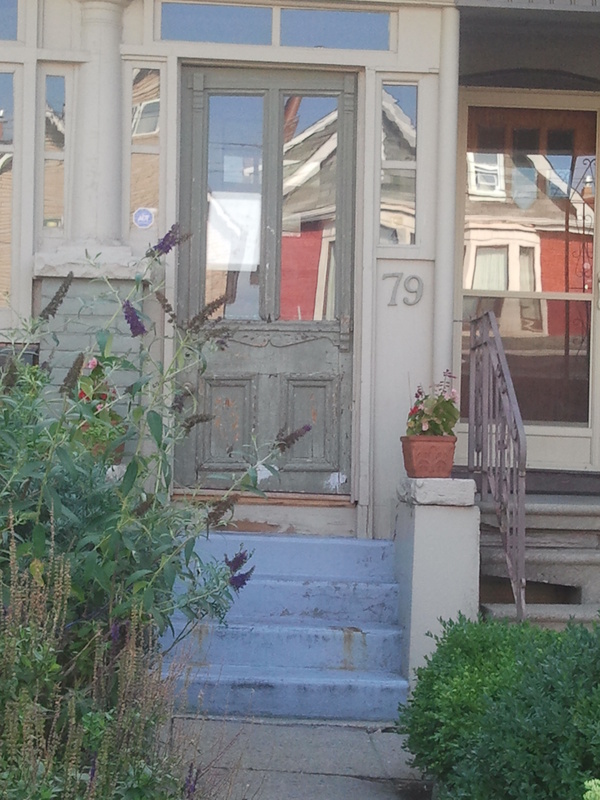 And all it took to give this house an awesome facelift was a new door and a fresh coat of paint! The old door was muted and drafty – it had to go. 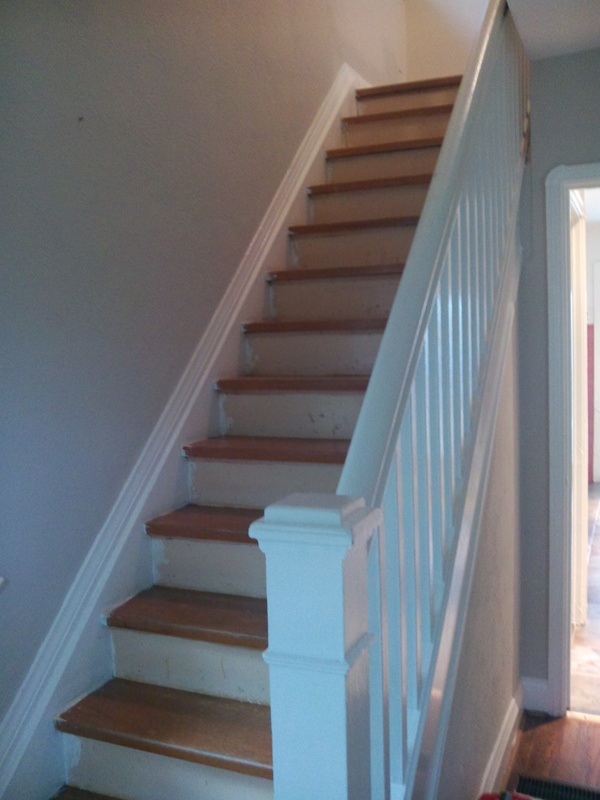 The home owners wanted us to repaint the stairs as well – this colour draws too much attention. This old door will come out, and the steps will no longer be the focal point. 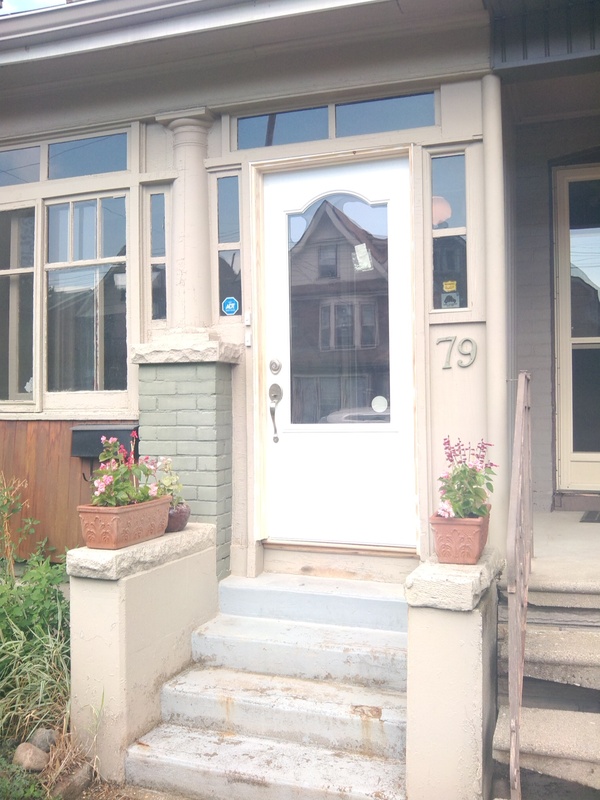 With a draft-stopping new door in place and the steps painted out in beige, this house looks 20 years younger, don’t you think? Browse through more exterior home projects in our gallery, or if you are a Real Estate agent looking an occasional handyman to work with your home owners, give us a call at 416-520-1161. The hallways and staircases are the arteries of your home – high traffic areas that must be safe for everyone to use, as well as prime real estate for showing off a collection of photos or creating built in storage. Add built-in storage under staircases or on large landings. 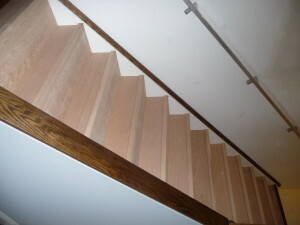 Wooden floors are beautiful, but wooden stairs can be slippery and dangerous. 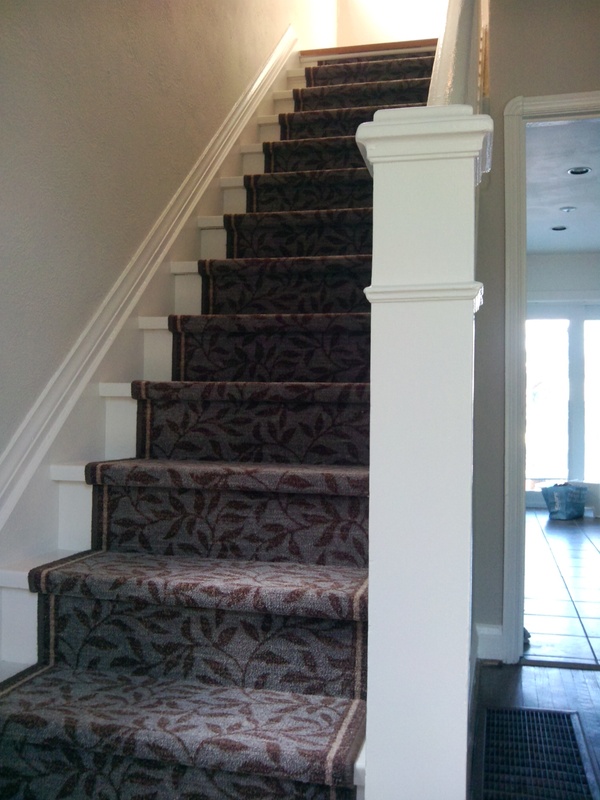 Adding a carpet runner is an easy way to add comfort and safety to your home. First, we’ll sand down the steps so they can be primed and painted. 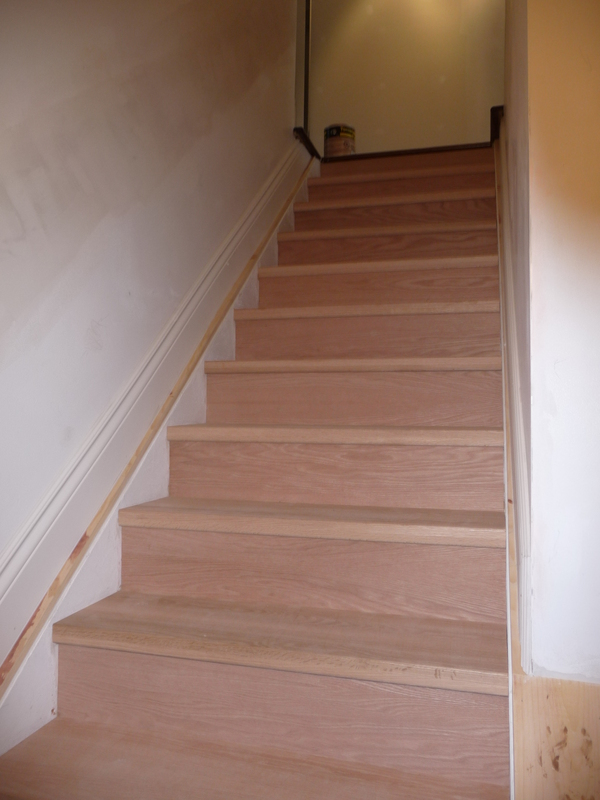 Plain wooden stairs, ready for a makeover. Now, this plush carpet runner will ensure that these stairs are safer and nicer on the feet, and the new paint job will ensure it stays beautiful for a long time! Instead of steep and slippery, it’s the comfort of carpet. Here are some other examples of what Odd Job has done for our clients’ halls, stairways and landings. Be sure to check out our service list for hallways and stairs, and remember, it only takes a minute to book an Odd Job handyman!